A number of indigenous cultures have foretold a time when humanity, our future, and the earth itself were at stake--due to human folly. In a typical fairy tale, folk legend, and in our hopes and dreams, at such a time "a hero" would come forth to save us. But suppose the hero wasn't a knight in shining armor, or all-seeing officers at an omnipotent military command central--no, suppose that the hero, or heroes, came from every corner of the earth, spoke eight languages and represented thirteen different traditions. Some traditions portray them as thirteen grandmothers, indigenous healers, called forth by dreams and prophecy to join together in prayer for the earth and its people. There is in fact a counsel of thirteen elder wise women-- called the Thirteen Indigenous Grandmothers. They have circled the globe, meeting with the Dalai Lama, leading healing ceremonies and prayer circles in India, Nepal, the Amazon, Alaska, Mexico, and Nicaragua. Last week they came to New York City. On Friday night, the film, For the Next Seven Generations in which filmmaker Carole Hart documents their extraordinary work, made its New York debut at the Urban Zen Center, the welcoming downtown gathering place, founded by Donna Karan. Over the weekend, the Jivamukti Yoga Center hosted the grandmothers in two evenings of prayer and healing. In welcoming the grandmothers to Urban Zen, Donna Karan revealed that, "To be able to celebrate this film and be with the Grandmothers is a dream come true for me. Urban Zen nurtures the wisdom of the past (in wisdom and indigenous traditions), the present (in health and wellbeing), and the future (through empowering our children). The Grandmothers remind us to celebrate the spirit of Mother Earth." I spoke with a number of the Grandmothers. "We're in a time of many alarming events and life crises that involve the basic elements of life: water, earth, sun (fire), and earth--the foundations of life are our concern," Mona Polacca, a Hopi and Havasupai healer and counselor from Arizona told me. "We're being a voice for the voiceless," said Agnes Baker Pilgrim, a Rouge River Indian elder from Oregon. "Mother Earth is calling us back. We're covering her face with concrete. We're polluting her waters with garbage. Enough is enough. When the trees and water are gone, how can the world banks manufacture money?" There is one enemy: greed, they agreed. "We pray for peace for all people," Said Julieta Casimiro, a Mazatec elder from Oaxaca, Mexico. Clara Shinobu Iura, who runs a healing center in the heart of the Amazon where she uses herbs to heal, points the way to peace. To create it, we first must create it within ourselves, she says. "It's very important for us to hear our own soul. You have to open the door to your own heart." she said. "Our time in this planet is so short. It's important for us to clean ourselves." 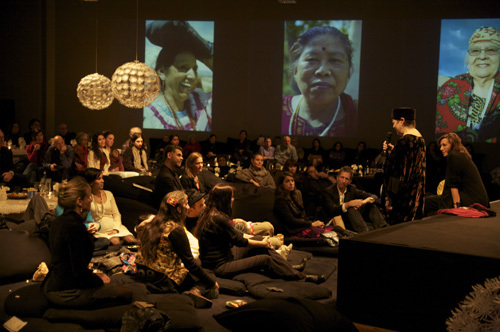 "Together, the grandmothers have almost nine hundred years of experience," said Flordemayo a Mayan healer from Nicaragua, "We are thirteen voices strong to remind humanity that we must unite to move into this new millennium. We're in the process of birthing a new way of being, a new way for all of us to be gentle with each other. We should connect our hearts and become one." 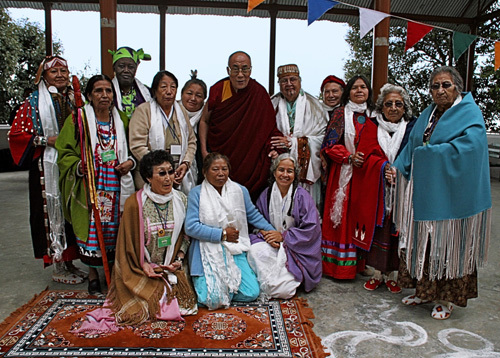 In their meeting in Dharamsala with the Dalai Lama, portrayed in the film, the Dalai Lama warmly greeted the Grandmothers and affirmed their goal, "The mother is the first real teacher of compassion. In creating a compassionate society, the mother is crucial. You are sharing the wisdom of that experience," he told the Grandmothers. And then His Holiness smiled and said, "If were not a monk, I would be a Grandfather."